Celebrity, awkward hairstyles and math intersect in this teacher’s unique approach to engaged learning. Ricky publishes and manages the content on BizTech magazine's website. He's a writer, technology enthusiast, social media lover and all-around digital guy. In the quest to make STEM more interesting, teachers are deploying all kinds of tricks. We’ve seen teachers turn math formulas into catchy hip-hop songs, and now the magic of the mullet is being used to inspire students to take more of an interest in math. It all started in 2012 when Matt Vaudrey, a math teacher in the Moreno Valley Unified School District in California, decided to spice up his 8th grade math class by giving himself a mullet and turning his “edgy” haircut into the basis for a lesson plan on calculating the perfect Mullet Ratio. What is the Mullet Ratio? Well, the haircut, popularized in the ’70s by rock stars like David Bowie, is often described as “business in the front, party in the back.” In other words, the hair is trimmed short in the front and on the sides, but left wild and long in the back. 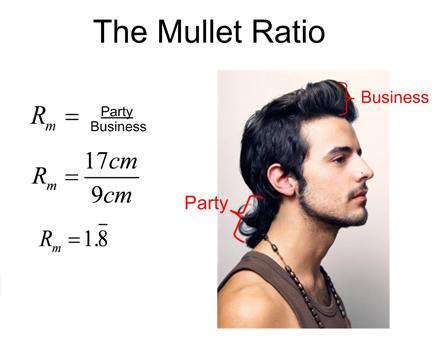 But there’s a wide range of interpretations for “long” and “short,” so Vaudrey and his class set out to find the perfect business-party mullet ratio. The result of all this mullet-inspired calculation and arithmetic? Real-deal student engagement and enthusiasm. “This is the best homework we’ve ever had,” said one student, according to Vaudrey’s blog. 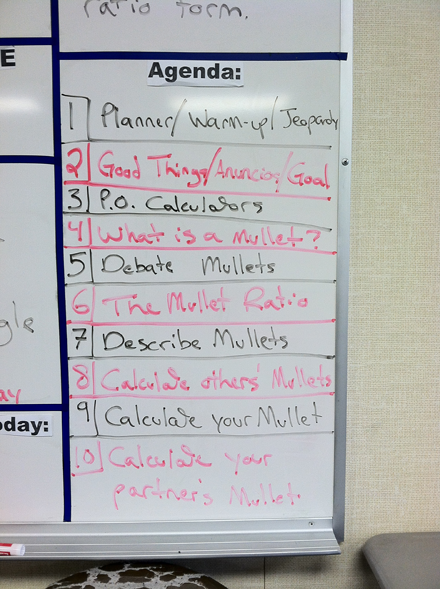 So 2012’s Mullet Ratio lesson plan was a hit. How could Vaudrey top that? How about by extending the Mullet Ratio lesson into a weeklong affair across the whole math department? Shark Week ain’t got nothin’ on that. Vaudrey describes the new-and-improved Mullet Ratio lesson plan in a blog post from December last year. He also encouraged the kids to get up from their desks to complete the assignments so they didn’t get too bored from sitting the entire time. The best part about Vaudrey’s gut-busting, pop culture-referencing lesson plan is that he’s not keeping it to himself: He’s teaching it to other teachers as part of La Cucina Matematica training, which he does with his colleague John Stevens. Recently, the math whiz-kids visited California’s Mariposa County Unified School District to share the wonders of the Mullet Ratio. If Vaudrey can succeed in making mullets educational and math entertaining, who knows what will happen next. Kids may start asking for brussels sprouts for lunch rather than fries.